We know that Latinos have a long history in our state, and Oregon is becoming increasingly diverse as a result of marked growth among this population. So now we need to pay attention to how Latinos are represented in various aspects of community life and democracy – so we can make sure all Oregon residents are fairly included. Available data suggest that Latinos are significantly under-represented in Oregon leadership roles. Demographic causes of this under-representation include measurement limitations, the age structure of the Latino community, and the citizenship status of many residents. This under-representation means that decisions affecting this population are being made by people who have limited personal experience of Latino issues – a fact that conflicts with most of our values for a representative democracy. 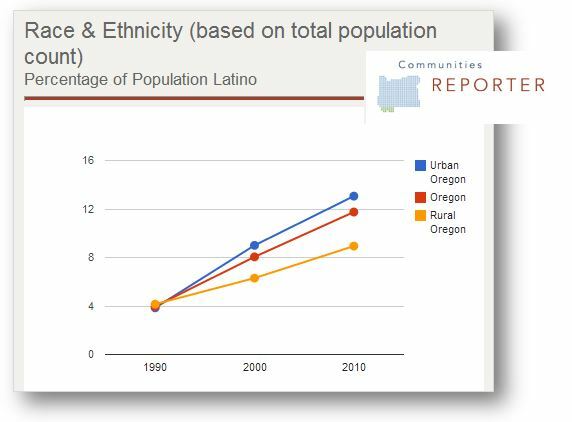 According to sample data from the 2012 Current Population Survey, November Supplement, administered by the US Census Bureau, only about 3% of all 2012 Oregon voters were Latino. Compared to the 11.7% representation of Latinos in Oregon, Latino voters were under-represented among Oregon voters by almost nine percentage points. According to data from the 2007 Survey of Business Owners, administered by the US Census Bureau, 3% of all Oregon businesses were owned by Latinos. Latinos were thus also under-represented among Oregon business owners by about nine percentage points. According to data I compiled from GovTrack.us, the Oregon Legislature, Association of Oregon Counties, Oregon School Board Association, and the League of Oregon Cities, and compared to data collected by the National Association of Latino Elected and Appointed Officials (NALEO) Educational Fund in Washington, DC, Latinos made up less than 1% (about .3%) of all elected office holders in Oregon in 2008 (serving at federal, state, county, city, judicial/law, and education board levels). Latinos were under-represented among Oregon elected officials by 11 percentage points. 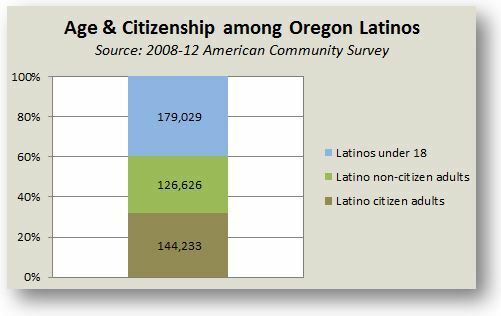 Only a third of Oregon Latinos are citizens and over the age of 18 (see chart below). Thus, only a third of Oregon Latinos are eligible to vote, run for office, or likely to own businesses. Even if we account for the age structure, Latinos are still under-represented in leadership roles I was able to measure; Latino adults represent 9% of Oregon’s adult population. There are many forms of leadership for which we don’t have public, reliable, and regularly available data about race and ethnicity – like legislative staffers, non-profit executive directors, government agency heads, neighborhood association leaders, and other informal local leadership positions. It is much easier to enter these types of leadership positions than elected office, so Latinos are more likely to be in these types of roles than formal elected offices. Being unable to measure the number of Latinos in these leadership positions means I am probably under-counting Latinos in leadership. Even if we account for the age composition of Oregon Latinos, this group is still under-represented in leadership roles (proportional representation percentage would be 9%). What are some of the social reasons Latinos may be under-represented in leadership roles in Oregon? I’m leery of the ‘underrepresented’ rubric – and here are a few examples why. First, it suggests we should have political representation based on percentage ethnicity of the general population – if this were true, we’d then have to decide on which ethnicities to count. Poles? Latvians? Irish? Vietnamese? Hutus? If the percentage of the general population is below the minimum for a representative do you then not get to be represented? For example, if a group needed at least 1/30th to have a state senator, if that group fell below 3.3% they wouldn’t get a senator. 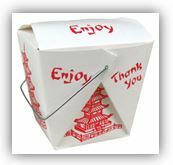 There are subgroups in our population that would then not get represented. There are many who actually don’t speak a Latin tongue – & they certainly don’t want to self-identify with the tongue of the conqueror. So would a Mexican qualify to represent Guatemalans? 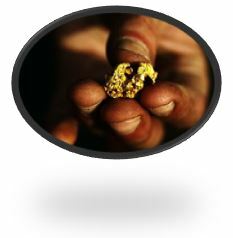 Unlikely – and even less likely for indigenous peoples? Third, this type of representation also ignores -why- there might be a difference in composition of a subgroup (leaders) from a general population. Here there is mention of citizenship – and of course legally that is a significant distinction. Likewise with age, and registration. If a certain population doesn’t register, or isn’t of appropriate age or citizenship, then these better explain ‘under-representation’. Fourth, it falsely suggests that one cannot be represented politically by someone not of one’s own demographic description. ‘In making her argument, Judge Sotomayor sounded many cautionary notes. She said there was no uniform perspective that all women or members of a minority group have, and emphasized that she was not talking about any individual case. Finally, one comes to whether the particular ‘underrepresented’ category chosen is appropriate. There used to be a time within living memory when dark-skinned individuals were significantly under-represented in various sports – and because of unfair & illegal discrimination. Nowadays, however, dark-skinned individuals are ‘grossly’ (in the numerical sense) ‘over’ represented compared to the general population. But one doesn’t hear any serious contention that we should reduce those numbers because out-of-proportion – that representation is based on something other than skin-color now, as it should be. Although I agree with my schoolmate Justice Sotomayor’s observations that it may be important to have some representation by a Latina on the Supreme Court, I do note that if we took religious background or educational institution or geography into consideration, the last appointments wouldn’t have happened – Yale [& Harvard], the Northeastern States, and Catholic [& Jew] are ‘over-represented’ on our Supreme Court – and Sotomayor fits into all of those overrepresented categories (Yale, New York, and Catholic).